Some of you have asked about my cousin/nephew's garden in Ahmedabad. Well, it is HUGE running into a few acres! In this section they plant seasonal flowers and is the view from his bedroom! The tent like thing at the end is where we have morning tea/coffee on holidays. My cousin and his son & family live together. I spend more time with my nephew & his lovely family as he is closer to my age. They have a team of people looking after the garden and you'll understand why when I post pictures of other parts of the garden! Nice to see some of Harsh's work reappear. Wherever he went, his unfailing eye found something interesting to share. Such an incredible garden; Harsh has such an amazing body of work; we sure miss him! 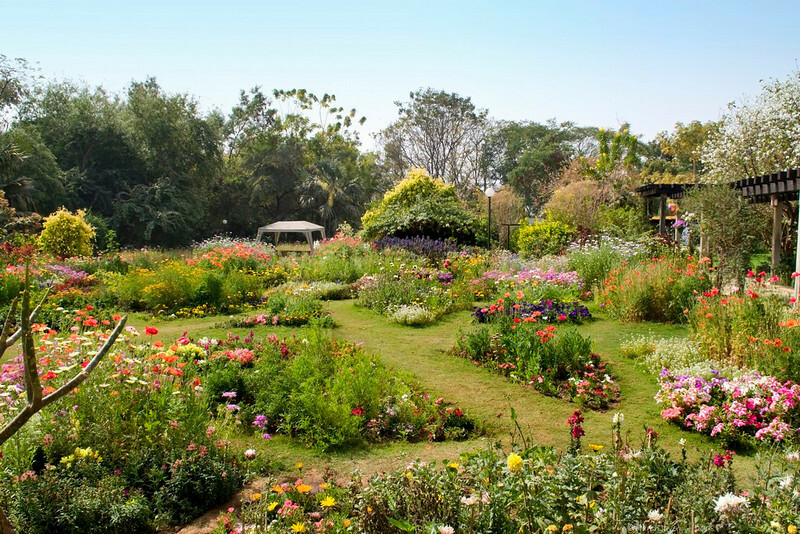 What a BIG & beautiful garden! Your cousin sure has good taste!